Bluehat UK has forecast that its gross profit will be more than £1m for the year ending January 2011, compared to £660,157 for the previous year. 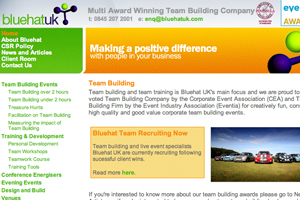 The teambuilding and corporate event agency recorded a gross profit of £663,769 for the six months ended July 2010. Corporate clients who have helped boost the agency's figures include BT and Tesco, which have both appointed it to run internal events this year, said Bluehat managing director Tim Shepley. "We worked so hard last year on client relationships, that now when people are booking they are talking to us first," he said. The agency has recently increased its staff which is set to reach 19 by October.